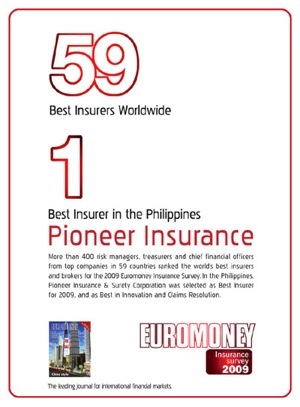 Pioneer Insurance bags the 2009 Best Insurer by Euromoney. Congratulations to Pioneer Insurance for winning the award.Specially to Binondo Branch headed by Mr. Jojo Nazal. than 50 insurance companies in the Philippines, and a low 10% target market. The entire insurance industry suffers from the diving prices of the premiums hence the difficulty in releasing claims at some times. To know more about Pioneer Insurance Products. Please call us at 7245140, 7447085.
i strongly believe in the capacity of pioneer insurance in the expertise of insurance protection provider. more power to the officers and staff. hope pioneer can also extend their services internationally.